If ticket-holders didn't know better, they might have thought they were crashing a real wedding reception at last night's sold-out performance of Lee Mueller's "I'm Getting Murdered in the Morning." Thanks to Aida's Events, the usually spare Clifton Town Hall was transformed for Clifton Dinner Theater's inaugural performance, bedecked in lavender tulle and topiaries. The atmosphere was authentic, right down to the antique Bentley limousine parked in front. Aside from its dedicated cast and crew, this very funny, even somewhat silly, murder mystery drew on recognizable references to the people and places that make the tiny town unique. Several volunteers, including Julie Thompson, owner of the Clifton Wine Shop, tended bar during a very social cocktail hour. Act One opened as guests (audience members) were served dinner by a group of local students and Clifton residents Felicia Wright, Gail Gertner and Lisa Graine. Disc Jockey (Sonarak "Rak" Ieng) announced to the guests that the spoiled bride and her cloddishly endearing groom (played by both Nichole Klocke de Rodriguez and David Barnett) have been delayed, due to a flat tire on the Fairfax County Parkway. 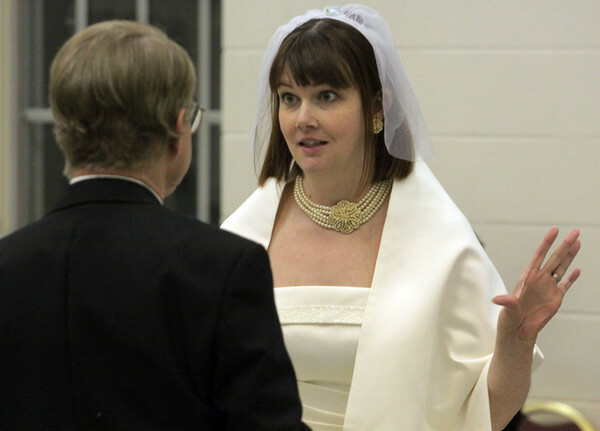 As guests awaited the not-so-happy couple's arrival, they became acquainted with their well-heeled host and hostess (Harold and Mildred Montegieu) and members of the bridal party, Benny and Bunny, played by Hilary Rinke and Terri Grimes Marin. An obvious veteran of community theater, Marin was particularly engaging in her role as the "know it all" Maid of Honor. As traditional reception rituals played out, a "murder" occured, threatening to sully the Montiegieus' already compromised reputation. After all, this is their daughter's third (or is it her fourth?) trip down the aisle. Lorraine Hoppe of Fairfax Station is delightful as Mary Burger, the society reporter who steps in, along with "fact-finder" Parker (former Clifton Town Council Member "Brant" Baber) to solve the quizzical crime. Wayne Matten is dryly funny, if quiet, in his role of Alfonsius P. Buckley, the victim. Stand-out performances were given by Helen Rusnak in her role as Mildred, mother of the bride, and Jolanda Janczewski in her role as mother of the groom, Sheila Coquette. The crime-solving process inevitably reveals many motives for Buckley's murder. It is the play's cataclysmically coincidental and hilarious solution that "made" this production and had guests falling out of their seats with laughter. Without spoiling the conclusion for tonight's "guests," suffice to say that in true murder mystery form, the killer is the very last person anyone would suspect. Cast and crew concede the production was intentionally colloquial. That is where its charm lies. While one cast member admitted to missing more than one of his lines, he said fellow cast members were quick to adjust. "It's not just about the performance, it's about the whole community," Lorraine Hoppe added. Producer Dianne Janczewski said the group is still considering future productions the group will tackle, and her pleasure in a job well done by all was evident last night.